Preheat oven to 250°F. Using a Presto® popcorn popper, prepare popcorn as directed. Spray a large mixing bowl and a rimmed 17" x 12" baking pan lightly with no-stick cooking spray. Place popped popcorn inside mixing bowl, removing any unpopped kernels; set aside. In a medium pan, combine butter, brown sugar, corn syrup, and salt. Bring to a boil over medium heat, stirring constantly. Lower heat; boil 5 minutes without stirring. Remove from heat and stir in baking soda. Gradually pour over reserved popped corn mixing well to coat. Spread coated popcorn evenly into prepared baking pans. Bake for 1 hour, stirring every 15 minutes. Remove from oven and cool completely. Using a Presto® popcorn popper, prepare popcorn as directed. Discard any unpopped kernels; set aside popped corn in separate bowl. Meanwhile, melt butter in a 6-quart pan. Add cheese flavored seasoning stirring continuously until cheese seasoning is mixed with melted butter. Remove from heat. 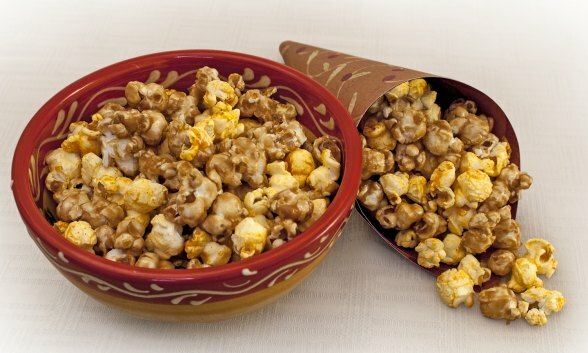 Pour popped corn into the pan and stir until popcorn is evenly coated with cheese mixture. Pour the coated popcorn onto a rimmed cookie sheet and separate kernels while corn is still warm. Allow to cool completely. If a more cheesy coating is desired, immediately add 1 to 2 tablespoons cheese seasoning and stir to coat.